Beautiful Social is excited to announce our tenth, eleventh, and twelfth Foley Fellows: Taylor Burke, Caitlin Gillard, and Abbey Piro. Carly Montecalvo, who was a Foley Fellow in Spring 2017, will be a Fellow again in Spring 2018 after spending the Fall in Copenhagen. Foley Fellows are named for John Cardinal Foley, who served as Grand Master of the Equestrian Order of the Holy Sepulchre of Jerusalem from 2007 to 2011 and held the position of Vatican correspondent for the Philadelphia’s archdiocesan newspaper. The Fellows are exemplary students who function in ways similar to Project Managers: they act as liaisons between the clients and the student teams and help the teams succeed in their projects. Fellows also perform in ways similar to teaching assistants in that they lead class discussions, plan and take part in Beautiful Social activities, and work with the Director to ensure the program is living up to it’s mission and values. We asked Carly, Taylor, Caitlin, and Abbey to introduce themselves. Here's what they had to say. Hello! My name is Taylor Burke and I am a Junior at Saint Joseph’s University. I am a Communications Major with minors in Leadership, Ethics and Organization (LEO) and Art and I am from West Chester, Pennsylvania. I like to be super involved on campus as I am a sister of Alpha Omicron Pi, I serve as the fundraising chair on the Relay for Life executive board and I am a Community Partnership Coordinator (CPC) for the Weekly Service program. As a student of Saint Joe’s I have been afforded a lot of opportunities to grow as a person. Saint Joe’s is a school that wants it’s students to be more than just students. This dedication to educational and personal growth is the main reason I decided to come to this school. That decision was the best one I could have ever made, because I have been introduced to so many things that I am now incredibly passionate about. When I had my first meeting with my advisor freshman year I had no idea what I wanted to do with my major. She told me about Beautiful Social and it instantly became my goal. I absolutely had to be a part of it. I took the class for the first time last semester and was hooked. I am so lucky to have this opportunity to be a fellow this semester to continue my involvement with B: Social. Beautiful Social has given me a new understanding of what it means to be with and for others. I cannot wait to see what this fellowship teaches me this semester. Hello! 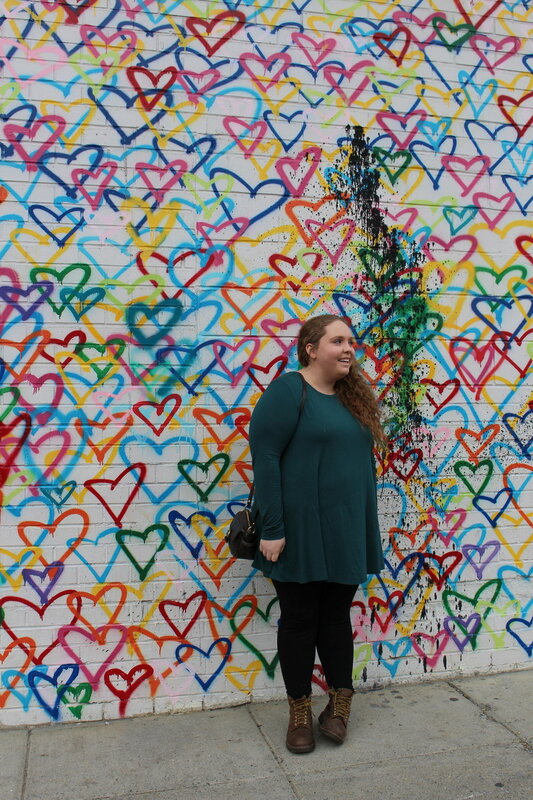 My name is Caitlin Gillard, and I am a junior Communications major and Psychology minor from Alexandria, VA. I am stoked to be returning to the Beautiful Social Research Collaborative, this time as a Foley Fellow! My two previous semesters in Beautiful Social were spent as a consultant for the Fostering Brighter Futures campaign, which is based in Texas and aims to paint foster care in a positive light, and show the world just how important the foster care system is. The knowledge that I gained about foster care, content creation, working with non-profits, and so much more over those two semesters is something that I am grateful for every day, and I can’t wait to help foster that knowledge in other students. Outside of Beautiful Social, I stay involved on campus as a station manager and DJ for Radio 1851, the campus radio station, a participant in the weekly service program, and a member of the Ultimate Frisbee team. Using social media as a means of promoting positive social change is a concept that I am incredibly passionate about, which is why the Beautiful Social program has become so important to me. I am so excited to be able to play a part in helping the program grow. Hello (again) world! My name is Carly Montecalvo and I am a junior Communications Major and Advertising & Promotions minor from Berwick, Pennsylvania. At SJU I like to stay involved in the wonderful community by being a part of organizations like the American Marketing Association, Alpha Gamma Delta Fraternity, and, once again, as a Foley Fellow for the Beautiful Social Research Collaborative! I was lucky to serve as a fellow in Spring 2017, after which I studied abroad in Copenhagen, Denmark. I am beyond excited to rejoin the B:Social team, bringing a world of knowledge back to an organization that has given me the world! I chose to attend Saint Joseph’s University due to its commitment to serving others, and during my time on Hawk Hill the classes I have taken have continually challenged this notion. As I begin the latter of my undergraduate career I have been able to gain an understanding of what it means to truly aid a community, understand the challenges faced by people unlike myself, look at the mediums hindering change, and work to better this system in ways my skillset and passion allows. Beautiful Social grants those involved to partake in experiences that create lasting impressions, and present work that allows the communities and people to have an outlet to have their stories told. I am thrilled to once again be able to share this opportunity with my fellow fellows and student consultants! As a Foley Fellow I hope to continue to grow my understanding of what it means to serve others, by continually being present, asking questions, reflecting, and growing in solidarity. Hey everyone! My name is Abbey Piro and I am a junior Communications major with a double minor in Journalism and Entertainment Marketing from a small town right outside Washington D.C.! In my free time, I enjoy doing anything that involves me going outside and seeing the world. That includes going to shows and discovering new music, attending hockey games, playing and coaching sports, and just exploring the city with my friends. Growing up I always loved bettering my community through service and volunteer work, so when looking at colleges, I sought out a school that would allow me to continue that and complement my academic experience at the same time. Saint Joe’s provides me with a multitude of opportunities, both in and out of the classroom, to continue my service and learn along the way. Once I heard about Beautiful Social and all the good it does I knew I had to be a part of it. I’ve had the pleasure of working with Beautiful Social twice (in the Fall 2016 and the Fall 2017) as a Student Consultant, and am extremely excited to have the opportunity to work with B:Social again as a Foley Fellow! This program has given me the chance to combine my passion for digital media with my love for being an engaged member of the community; teaching me so much about myself all along the way. I am so excited to take on this new role and cannot wait to continue to be a part of all the good Beautiful Social does! Beautiful Social is excited to announce our ninth Foley Fellow: Caroline DeFelice. Foley Fellows are named for John Cardinal Foley, who served as Grand Master of the Equestrian Order of the Holy Sepulchre of Jerusalem from 2007 to 2011 and held the position of Vatican correspondent for the Philadelphia’s archdiocesan newspaper. Foley Fellows are exemplary students who function in ways similar to teaching assistants: they act as liaisons between the clients and the student teams and help the teams succeed in their projects. Fellows also lead class discussions, plan and take part in Beautiful Social activities, and work with the Director to ensure the program is living up to it’s mission and values. We asked Caroline to introduce herself. Here's what she has to say. Hi! My name is Caroline DeFelice and I’m from Red Bank, New Jersey. I’m a Communications major and Art History minor here at SJU. On campus, I'm involved in Weekly Service. I volunteer at a local after school art program where I teach art lessons to kids from the surrounding Philadelphia area. Outside of the university, I am an artist, graphic designer, photographer, and yoga instructor. Some of my favorite projects that I have worked on are designing a yoga mat for the company Live Sankalpa, painting a mural in a surf shop in NJ, and photographing the 2017 Philadelphia Farm & Food Fest. I heard about Beautiful Social during my sophomore year at Saint Joe’s, and was immediately drawn to the idea of utilizing social media to work for social justice. During the Spring of 2017, I enrolled in the course and fell in love with the process of learning and growing alongside my fellow student consultants---while ultimately working to communicate the unique vision of our amazing client. Images are powerful, and we consume millions of them almost every day. As our society becomes increasingly globalized through the Internet and social media, I believe that images continue to be one of our greatest forms of communication. As a Foley Fellow, I'm excited to have the opportunity to synthesize my passions for art, image-making, and civic engagement to forward the visions of nonprofits and community-based organizations. Beautiful Social is excited to announce our seventh and eighth Foley Fellows: Molly McDonald and Carly Montecalvo. Foley Fellows are named for John Cardinal Foley, who served as Grand Master of the Equestrian Order of the Holy Sepulchre of Jerusalem from 2007 to 2011 and held the position of Vatican correspondent for the Philadelphia’s archdiocesan newspaper. Foley Fellows are exemplary students who function in ways similar to teaching assistants: they act as liaisons between the clients and the student teams and help the teams succeed in their projects. Fellows also lead class discussions, plan and take part in Beautiful Social activities, and work with the Director to ensure the program is living up to it’s mission and values. We asked Molly and Carly to introduces themselves. Here's what they have to say. Hello!! I'm a junior studying Communications and Digital Media with a minor in Gender Studies and also serve the community as an Orientation leader and through my involvement with Weekly Service. Outside of school, I am a yoga instructor at Grace and Glory Yoga and enjoy spending time outside, reading, and exploring Philadelphia. I first worked with Beautiful Social in Spring 2016 and I'm excited to be a part of the B:Social team and to have the opportunity to collaborate and co-create with organizations making a positive impact in the community and with the Student Consultants both inside and outside of the classroom. When looking at colleges I knew that I wanted to go somewhere that prioritizes service and found ways to incorporate service into the academic experience. I see B:Social as an amazing opportunity to marry my interests in digital media design and marketing with my passion for working with service oriented organizations and my interest in the non-profit sector. I'm excited to work with students and organizations in an integrated learning environment where we can apply what we are doing in the classroom to working with the clients. Hello world! I'm a Sophomore Communications Major and Advertising & Promotions Minor from small-town Berwick, PA! I love to stay involved on campus at SJU because it allows me to learn more than what is taught inside the classroom, grow as both a student and individual, and meet some of the coolest humans throughout it all! As such, I'm also VP of Community Service & Communications for the American Marketing Association, Website and Social Media Coordinator for Alpha Gamma Delta. Choosing to come to SJU was no simple task, because no school seemed to give me that wow moment. I found myself worrying a lot more about how the school could get me where I needed to be, rather than focusing on the aspects of the school that would help me grow not only as a student, but as a person. When I came to SJU I was able to listen to professors and students speak about the Beautiful Social program, and finally realized that this would be my perfect fit, I finally had my wow moment. After taking the course and being a consultant for B:Social I know that I made the right decision, because Beautiful Social allows me to participate in something larger than myself and my world back home and on campus. Outside of school, clubs, and just navigating the world, I enjoy filling my time with anything and everything that brings a smile to my face. This usually includes daily calls to my mother, Saturday morning face times with my sister's puppy Belle, runs at the Merion Botanical Gardens, and exploring Philadelphia and their many eclectic coffee shops. I am so grateful for the opportunity to work for such an amazing program that works towards such an amazing cause. Beautiful Social has already taught me so much about myself and the world, and I know that this opportunity will allow me to learn, grow, and experience more than I could ever imagine.